My Chinese New Year recipes continues today with everyone’s favorite Cantonese Soy Sauce Chicken (豉油鸡)—a staple chicken dish commonly found at Chinatown BBQ joints here in the United States and around the world—dark and glossy whole chicken dunked in a soy sauce mix with meat so tender, silky, and juicy that they are one of the must-have’s for Cantonese-style BBQ rice plates. If you have been to a typical Cantonese BBQ restaurant, I am sure you have had soy sauce chicken. I can hardly resist the tempting looking chicken with the perfect sheen, hanging at the display window calling my name! Soy sauce chicken is utterly delicious, especially when you dip it with the ginger and scallion condiment. The thought of it just sets my mouth watering. Chinese love chicken and there is always a chicken dish on the Chinese New Year menu, so what about serving soy sauce chicken this year? Soy sauce chicken (豉油鸡) is really not so hard to make, and you don’t have to use a whole chicken. I didn’t because I didn’t have a pot big enough to contain a whole chicken, plus, I must confess that I don’t have great knife skills (I didn’t go to culinary school!) to make perfect chops. I used chicken leg quarters but you can use cut up whole chicken, too. Of course, if you have all it takes, by all means, use a whole chicken. Do try out this soy sauce chicken recipe (豉油鸡), it’s pretty darn close to the ones at my favorite BBQ joint here in SoCal. I saved the soy sauce mix to make various accompanying dishes such as Chinese soy sauce eggs (滷蛋) and soy sauce fried tofu (滷水豆腐). Super yummy! 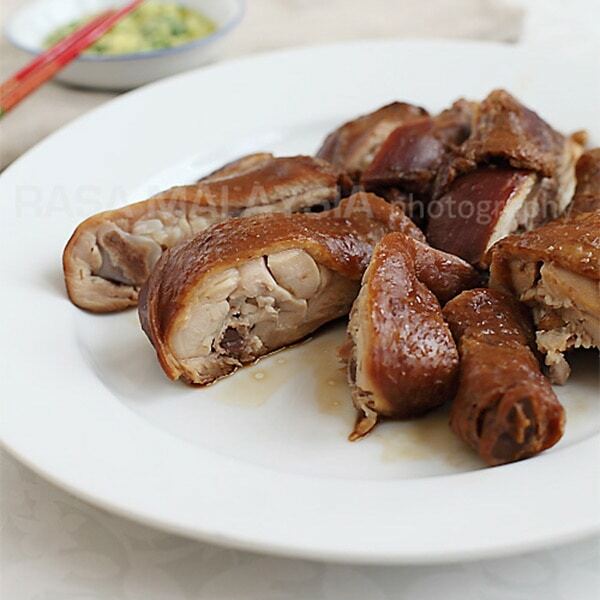 Soy Sauce Chicken - dark and glossy whole chicken dunked in a soy sauce mix. Also try dipping it with the ginger and scallion condiment. To prepare the ginger and scallion dip, place the ginger, scallions, salt, and chicken bouillon powder into a small bowl. Heat up 2 tablespoons of oil in a wok until it starts to smoke. Pour the oil into the small bowl and blend well. Set aside. Some dark soy sauce is darker than others. I used Kimlan dark soy sauce which is not that dark, so I used 1/2 a cup. If you have a very dark soy sauce, you should probably use less. I had the best Dongbo Rou (东波肉) in a Shanghai restaurant and they used dried honey dates (蜜枣) to make their soy sauce mixture. 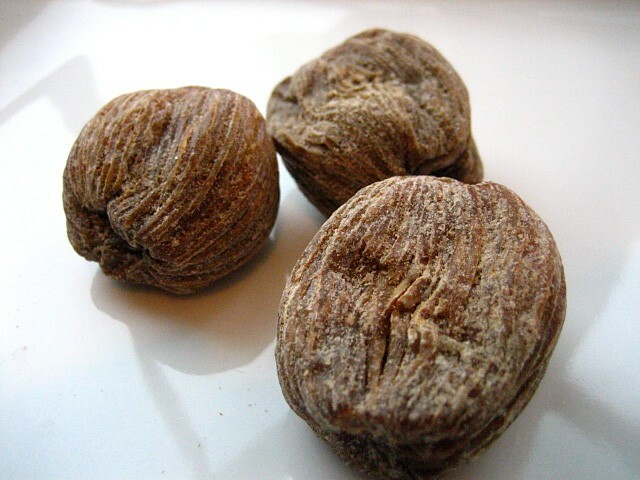 Dried honey dates impart delicate and natural sweet taste to soups and stews and widely used in Cantonese cuisine. It's optional if you don't have them. Save the soy sauce mix. It's great for soy sauce eggs. Add a few hard-boiled eggs into the soy sauce mix and steep them overnight and you have some great tasting Chinese soy sauce eggs (滷蛋). You can also use the soy sauce mixture to make soy sauce tofu (滷水豆腐); deep fry the tofu and soak it with the soy sauce before serving. every Chinese cuisine,is very appetizing, love it! It is definitely better if you can cook the chicken whole, but alas, not practical to do at home. I have a huge electric pressure cooker that doubles as a slow cooker. I can fit a small whole head/feet-on chicken in it. The chickens I get are not the artificially “fat” ones from factory-farms. They’re locally grown roosters and are sold fresh at my local Asian market. Real chickens, young and tender. They only have them once a week and the date on them is from that morning. Really fresh! They have a bit gamier taste but, if you think about it, that’s how chickens used to taste before they were “mass produced.” I thought they were expensive at first until the guy behind explained to me about these birds. Cornish hens, whole, work well. This looks AMAZING. I am salivating for some soy sauce chicken and tea eggs right about now… time to hit up Chinatown to get some ingredients! Why are you doing this to me, Bee!? This soy sauce chicken looks absolutely incredible. And i love anything with the ginger/scallion condiment on it. That’s a double winner! Perhaps, we can use a whole Cornish Hens too since they are small enough to be simmered in a “regular” size pot. Any thoughts? Yes, I love the soy sauced eggs and let’s not forget the soy sauced pig ears!!! Tuty – oooh, soy sauce pig ears. How can I forget that? Hehe. Yes, I guess you can use cornish hen but the texture of the meat is different though. Yeah, bummer for not having a big pot. a two in one dish (chicken and egg) and both are food i like. thanks for the recipes and great photos! Wow I didn’t know it was so easy to make this. Will definitely try this as an alternative to the hainanese style. Thanks. Everyone in my family loves soy sauce chicken. And the soy sauce tastes even better after cooing the chicken. Have to reserve the sauce and cook with other favourite foods. In the BBQ restaurants here, all soy sauce chicken are served with the ginger and scallion dip. I love it. Hi Bee, this is simply tasty! My type of food, will surely bookmark this. I am hungry now! Thanks for sharing. this dish makes me so homesick for family, mom’s cooking, grandma’s cooking – the smells of the kitchen i grew up in. Love this dish of yours and I especially like having it with the ginger and scallion condiment. Another condiment that I go for is the Chinese mustard. I have been using Lee Kum Kee’s Soy Sauce chcken sauce …Pour whole bottle add another bottleful of water..boil….throw chicken in…..
dried orange peel boil with the mixture – optional as well. This is what I’d love to try out. It’s very similar to the way we do our chicken. Philippines have dark soy sauce tha I can try with this recipe like Lauriat brand which is my favorite. Viel – sounds good, let me know how it goes. hey Bee!! love ur site.. always keep revisiting when i can… but, its the first time i’m leaving a comment! i love love love love soy sauce chicken.. my trips to chinatown in toronto were never complete without a plateful of soy sauce chicken! never mind that more often than not, it was the sole reason of my visits to chinatown in the first place! Hi Sharon – thanks so much for your comment and promoting my website. I hope you like this soy sauce chicken recipe. I tried so many of your recipe and it turn out to be great! I believe it’s the salt content of your soy sauce as I had already mentioned in my notes, different soy sauce tastes different. I use low sodium ones. Add the soy sauce and dark soy sauce bit by bit, until you get the desired taste you want. If it’s too salty, add more water, improvise the recipe as it’s a guide rather than science. Make this 2 days ago.. absolutely yummilicious. I am planning to prepare this for up coming NCY party as well and was wondering how many times i can reuse the soy sauce. Do i just keep adding the chicken or if we need mix a new one? You can reuse the soy sauce a few times, that is no problem. I love your website! I just made this recipe, actually a slight variation of it, but in a pressure cooker. Half the time and sooooo delicious! Thanks. Pressure cooker, wow, how come I didn’t even think about that? Thanks for sharing the tip and trying my soy sauce chicken recipe! I have one question now that I have this delicious leftover cooking liquid. To make the soy sauce eggs, should they be shelled? I am guessing they should so they can absorb all the goodness, but I just wanted to make sure. Hi! Your soy sauce chicken looks amazing!! I followed your recipe but the skin on my chicken didn’t turn out nearly as dark or even as yours did. I would like to try again. Did you simmer with the pot lid on or off? Also, my dark soy sauce is quite dark and I still used 1/2 cup. Do you have any ideas as to what I might be able to try to make my chicken look as nice as yours? Hi Alison, I cooked with the lid on. Some chicken has really fatty skin so the fat resists the soy sauce entering the skin. Try to keep the chicken longer in the liquid. Good luck! Just tried this, turned out delicious! And very easy to make too! When i fry this in oil ? We cooked this the first time and my wife and son just loved it! Thank you for this great recipe. Next time I will try to put a little bit of chilli powder to make it a little spicy. If I cook it on a Friday and wrap it on a plastic wrapper and then to the refrigerator, will the taste be the same if we eat it on the following Sunday? Please advise. Sorry but I am not too sure because I have never tried keeping it for so long. I am a restaurant owner here in the Philippines and specialize in Southeast Asian and Chinese cuisine (its a group of restaurants. The dark and thick soy that we use comes from malaysia and not salty at all. Years ago, I worked with a girl from China who occasionally brought me some treats to snack on. Apparently her chicken was soy sauce chicken because it looked very much like yours and was delicious. She also brought me a soy sauce egg which was terrific. She got married and left … poor me. But lucky me that I found your site because I’m going to try making both the chicken and the egg, although in this case, there’s no question that the chicken will come first. A question – I’m pretty sure I can find all the ingredients locally, but in case I cannot find white pepper powder or rock sugar, can you suggest alternatives? I just made this recipe and love it! Thanks! However, I would like to know how to store the sauce to re-use. Should I drain out the scallions, ginger, etc. before putting the liquid in the fridge and ad new scallions, ginger, etc. the next time I cook with the sauce? How long can I continue to re-use the sauce after each chicken cooking? I am wondering if I could re-use the same sauce weekly. I have read other things about this recipe that say you can keep the sauce batch going for a very long time. Do you have any experience or suggestion for this? Thanks in advance! Very late rely, but I’d just like to say that I have reused the mixture multiple times with no problems in taste. I’m just cautious about re-adding soy sauce and other ingredients, fearing it will be too salty. So far so good! I have made this three times. My children will “keh pui” whenever I make this dish. I added hard boiled eggs. I keep the left over sauce for pork stew, fried egg noodles or dried tofu. Turned out delicious. Totally a multi tasking sauce. Wonderful. I had been looking for a good soy sauce chicken recipe for quite some time. I love this dish – I often order it at my favourite restaurant. I’ve also eaten it in various cha chaan teng in Hong Kong, and this is just as good, if not better. I’ve adapted the dish slightly to suit my kitchen (sorry ;) ), so I use two red dates and slightly more dark soy, and it tastes incredible. Hi Bee! Love your recipes. Have been frequenting your website ever since I moved to the US.. Didn’t really need to cook whilst in Malaysia! One question, when you say let the chicken steep in the sauce for a few hours, should that be done in the refrigerator or room temperature? As you can see I’m really an amateur in cooking. But really inspired by your recipes to cook more now. Moreover, ain’t easy to find good Malaysian food around! used the recipe on my slow cooker after i browned my chicken first. after 8 hours on low, meat was falling off the bone while retaining it’s consistency. I just made your soy sauce chicken recipe and it was so delicious! Reminded me a lot of my dad’s version (he always reused the same soy sauce liquid so it was incredibly flavorful). I took your advice and used the leftover mixture to make soy sauce eggs. I hate how over-cooked the yolk can be sometimes, so I made a few amdendments to suit my personal tastes. I boiled the eggs for only 5 minutes (no more no less) and then very gently peeled off the shells. I brought the soy sauce mixture to a near simmer, put in the eggs, and immediately turned off the heat. I put the lid on and let it sit for several hours. When I finally ate them, the yolk and the egg white were so soft and silky and utterly delicious! Thank you for sharing your recipe. perfect recipe. i can’t get enough of the sauce! taste just like an authentic chinese restaurant and i don’t have to travel to a chinatown or monterey park for it! Should it be boiled and fry just to get the crunchy skin ? The skin is not supposed to be crunchy for this recipe. Is there an alternative for the rock sugar? Have difficulties finding it in Geneva. Omg. I cant wait to make. It’s so easy and our local takeaways is so expensive. I have been making this recipe for years, since 2012. It has become a go-to for me, and a staple of my household. I LOVE this dish, and what I love just as much as the flavor is (1) how easy it is to prepare, (2) How leftovers marinate and get tastier and tastier over the next few days, (3) how long the shelf life is for many of these ingredients. I only have to buy honey dates once every several years, and the same goes for the star anise, rose wine, dark soy sauce, etc. I always have garlic and ginger stocked, so the fresh dish that I need to get is chicken. I buy legs and thighs in bulk. I can fit a tremendous amount with this recipe. Today I’m trying something new – this dish in a crock pot! So excited for dinner tonight. Thank you for this recipe! Hi Mu, awesome, I am so happy you tried my soy sauce chicken recipe. I have made this recipe nearly 10 times in the last few years – it has been a hit with my family each time. Thank you so much for this recipe!! I always follow it exactly and it works perfectly. An excellent chicken recipe, thank you very much. My family love chicken so much! I like it. Thanks for trying my soy sauce chicken recipe.